It’s getting to be that time of year-you know what time I’m talking about-wedding season! This year my step-sister is getting married so I get to have my own little part of the hysteria. You see, my husband and I were married during his two weeks of leave from a year-long deployment to Afghanistan. The dates of his leave kept changing and we ended up eloping just the two of us. While I wouldn’t change it for the world I did miss out on the “big” wedding fun. I’ve been excited to help my step-sister DIY her wedding and I’ll be sharing my DIY wedding shower next month. Anywho…the point of all this was that I have been playing with wedding ideas lately and went to the craft store to pick up supplies and saw David Tutera’s new wedding line. I decided to test some of it out! 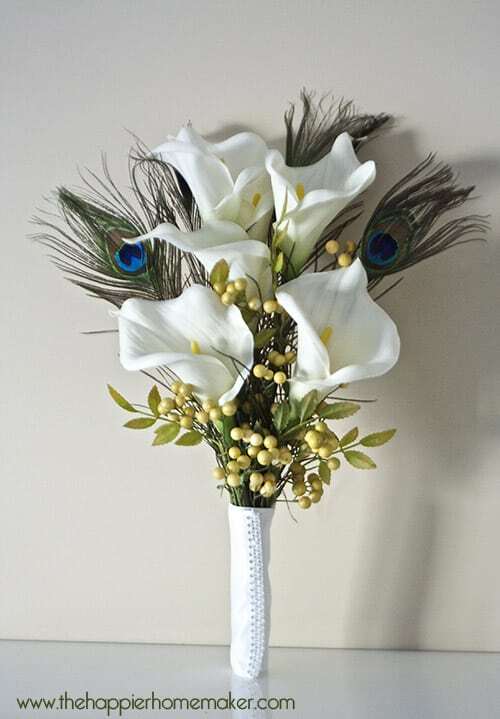 The first thing I did was to add the finishing touch to my step-sister’s bouquet I had recently created to match her lily and peacock feather theme. The David Tutera Bouquet Wrap was too easy to attach-adjustable velcro lets you adjust the wrap to the perfect dimensions of your bouquet. It’s gorgeous, right? I wasn’t sure what to use as the base of my bouquet…I had heard of some people using wire whisks but I didn’t have an extra on hand. I ended up covering an empty spool from my ribbon with a chunk of coffee filters! It worked perfectly! I glued floral wire to the back of my flowers then hot glued them to the coffee filter. Once it was all dry I gather the wires below the bouquet and wrapped them with floral tape. Then I covered the base with a toilet paper roll! (It seemed the right size!) 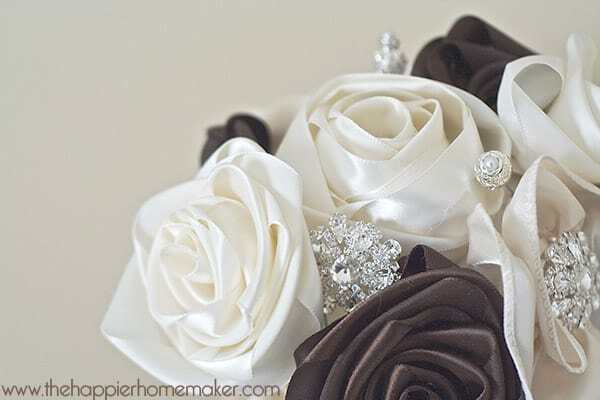 I hot glued the toilet paper roll at the base of the bouquet then covered the rest of the bottom with more flowers. Next it was time for the finishing touches. I wrapped the toilet paper roll in satin ribbon and then came the bling! 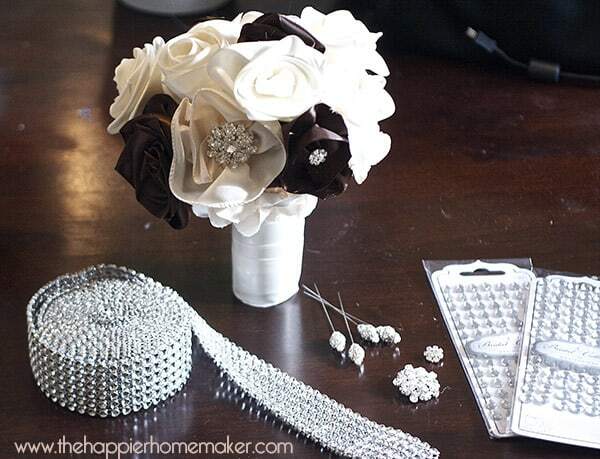 I added David Tutera Rhinestone Pins, Rhinestone Hair Snaps, and Rhinestone and Pearl Crown Picks to the flowers to add the necessary “bling.” I also used the Bling on a Roll to wrap the base of the bouquet and finish it off! Didn’t it turn out amazing? 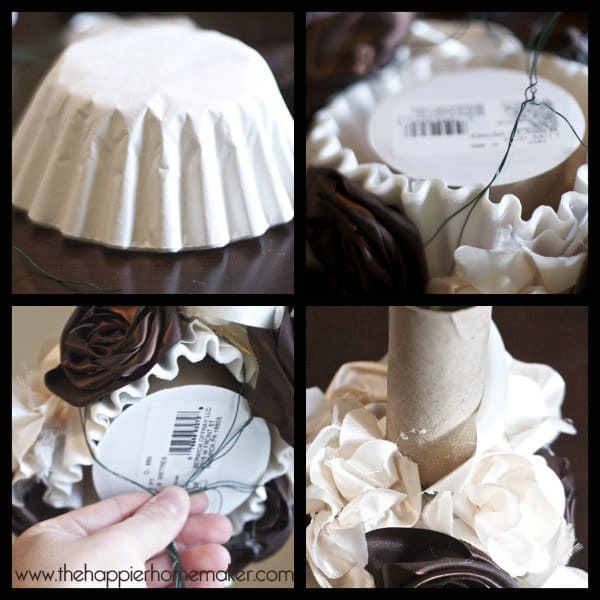 Can you believe it’s a toilet paper roll, empty ribbon spool, and coffee filters under there? I love it! It’s now adorning my shelf in my new office! 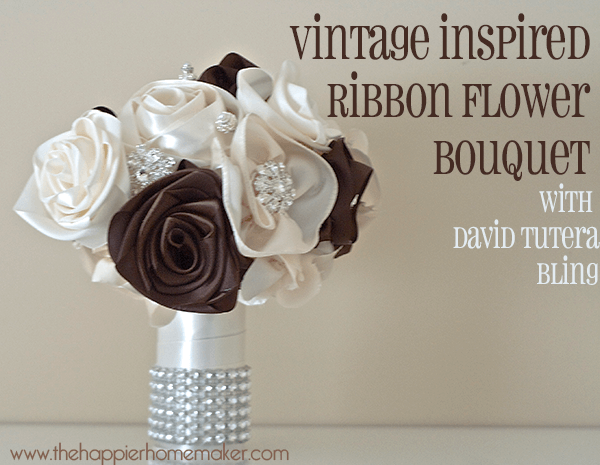 Would you make your own DIY Bridal Bouquet? myspace ցroup? Τhere’s a lot of people that Ι think would really aρpreciate ʏour content.